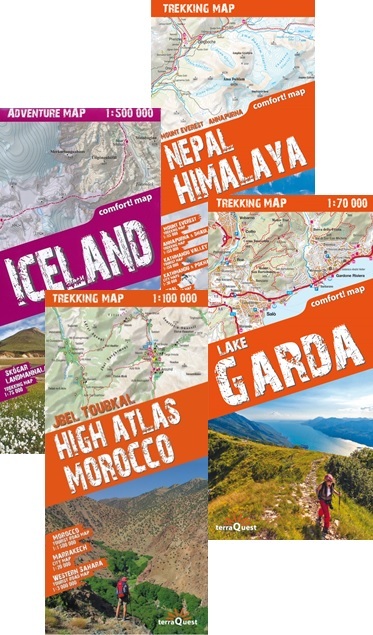 TerraQuest maps are designed and developed primarily for tourists preparing for treks to remote corners of the world. Our proven map laminating technology allows you to freely use the maps even in harsh conditions, while appreciating the clear and easy-to-read information compiled by our team of qualified cartographers. The distinctive feature of TerraQuest laminated maps is the manufacturing method. Due to a special lamination process and patented map joining techniques, the maps easily adjust to your choice of format, even for one-hand use only. They are exceptionally durable and may be folded repeatedly. You can also add and erase your own notes directly onto the map with an erasable pen without damage to the map.